Today we are releasing JReviews 3.5 to mark the transition to an open source license for all of our Joomla! extensions and WordPress plugins. This update is available to everyone starting today. At the same time, we are also launching new pricing plans to provide options with better value and to allow us to continue providing you with the best products and support. Existing license keys will be moved to a Legacy plan and the renewal price for the Legacy plan is also being updated. Please continue reading for more details about the new license, the new pricing plans and the transition of existing license keys to the new plans. 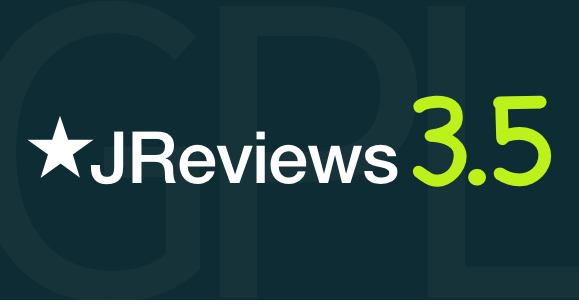 The first version of JReviews shipping with the new open source license is JReviews 3.5 which is available starting today. While remaining a paid product, JReviews 3.5 is now 100% open source. This important change gives you more control over the software installed on your site. Changing your license to open source is as simple as updating JReviews, Add-ons, and iReview to the latest versions available on our website. Please follow the instructions to update to JReviews 3.5. It's been just over 5 years since we last updated our pricing. Since then, we've released several new Add-ons and introduced many new features to our products. To continue developing great products and to better reflect the long-term requirements of customer support, we are making some needed changes to our pricing structure by introducing 3 new pricing plans. To find out how we'll be transitioning existing license keys to the new pricing plans, please refer to the section below entitled "Transitioning existing license keys". The following table details the basic features of each plan. For additional details, you can follow the links to the Joomla pricing plans and WordPress pricing plans. In this plan, the base price for JReviews remains unchanged and you can select the Add-ons you need. The key difference from the previous pricing model is that the renewal price for 12 months support & updates changes from a fixed price to a 20% discount applied to the plan price plus any purchased Add-ons, but not higher than $297. If you plan on buying many Add-ons, the "Professional" Plan is a better value. This plan includes all free and premium Add-ons, iReview template/theme, 15% off the Origami Mobile App, and has a 25% discount on the 12 months support & updates renewal. When compared to the Standard plan, in the "Professional" plan, the support & updates renewal price does not increase, regardless of the number of Add-ons you use. This plan provides support and JReviews App Store access for 5 sites, 25% off the Origami Mobile App, and has a 30% discount on the 12 months support & updates renewal. It's also multi-platform so you can use the same license key on Joomla and WordPress sites. The current pricing model will be phased out. To do this, all existing license keys will be converted to a "Legacy" plan and will continue to work exactly as before. Regardless of the number of Add-ons you've purchased, you have until the end of 2018 to renew your subscription at preferential prices. Currently, the renewal for licenses with active subscriptions is $109, while the renewal for licenses with expired subscriptions is $143. If you have a JReviews license without Add-ons, you'll get a 20% discount on renewals, equivalent to $143 for 12 months. If you have a JReviews license with GeoMaps, a 20% discount will be applied to the total list price; in this case, $179 + $69, equivalent to $198. If you have a JReviews license with GeoMaps + PaidListings + MyLists + UserProfiles, your renewal is capped at $197. This represents a substantial discount when compared to the Standard plan. Under the Legacy plan, you can still continue purchasing Add-ons in existence before October 14th, 2018 and receive updates for them. However, new premium (paid) Add-ons released after October 14th, 2018 will only be available for licenses under the new Standard, Professional, and Developer plans. This conforms to the new model where renewal of support & updates for Add-ons is no longer free. When upgrading a license key to one of the new plans you will get 12 months of support & updates and a pro-rated discount for any unused days in the current subscription period. The discount is calculated based on your last payment for that license key. When upgrading to the "Professional" and "Developer" plans, if you've purchased any Add-ons a pro-rated amount for those will also be applied as a discount towards the upgrade. If your license is in a "Legacy" plan you can enjoy preferential renewal prices until December 31st, 2018, to renew your support & updates subscription to add 12 months to your current period. Beginning in 2019, renewals in the Legacy plan switch over to a percentage-based discount of 20% applied to the list price of JReviews plus purchased Add-ons, with a maximum price of $197. Any new Add-ons released after today will only be available for the "Standard" plan or included as part of the "Professional" and "Developer" plans. I just purchased a new license key or have a license with an active support & updates subscription: You can stay in the "Legacy" plan and enjoy preferential renewal prices until the end of the year. You can also upgrade to one of the new plans and get a discount for unused days in your current period. If it's a new license the discount is calculated based on the purchase price. If you renewed your subscription, the discount is calculated based on the renewal payment. If you purchased any Add-ons and upgrade to the "Professional" or "Developer" plan, then a pro-rated discount for Add-ons will also be included. Any new Add-ons released after today will only be available to purchase in the "Standard" plan or made available as part of the "Professional" and "Developer" plans. What if I don't want to upgrade to the new plans: You don't have to upgrade to the new plans if you are on the Legacy plan unless you want to purchase an Add-on released after October 14th. You will continue to receive updates for all your purchased Add-ons even if you stay in the "Legacy" plan. Can I combine several license keys in the "Legacy" plan into a single license in one of the new plans: Each license can be upgraded separately to one of the new plans. It is not possible to combine them in any way. If you have any questions please don't hesitate to contact us via ticket or the Contact Us page. This post was updated on November 5th, 2018 to reflect changes made to the Legacy and Standard plans. I am thinking of upgrading to the Professional plan. If I upgrade I get a discount for the addons I've already purchased. Based on the current pricing plans, if I had upgraded, what happens the following year when I renew, will I still get a discount for the addons I originally purchased or will the renewal discount be a flat 25%? The Add-ons discounts are one-time only for the plan upgrade. Does updating to the OpenSource license automatically upgrade my plan? Can I upgrade to the OpenSource license and remain in my legacy plan? You can update to the latest version without upgrading to a different plan. In fact, we've made it very easy to do through one-click remote updates directly from within the JReviews admin dashboard, as long as you are already using JReviews 3.0 or JReviews 3.1. For more information feel free to submit a support ticket. I see a new update is out that allows us to update from Jreviews 3.1 to 3.5 directly from the Admin. So unused files from older versions will be deleted, etc... no need to uninstall JReviews 3.1 to upgrade like it stated in the upgrade article anymore? what add-on's are free and what add-on's are premium? Free Add-ons include: RapidLauncher, Queue and the Add-ons Manager. Premium Add-ons are all the other ones that have been paid up till now: GeoMaps, PaidListings, Stripe, Mollie, Import, UserProfiles, ListingResources, MyLists, Everywhere, WidgetsFactory, .... You can see a list of the paid Add-ons and their individual prices in the pricing plans page for Joomla and WordPress under the plans table.